Foot supported Back-Pull-Out construction makes maintenance easy without disturbing motor and piping. GS/GF can be used at wide range of pumping temperature (-50ºC∼200ºC). GS/GF is able to conform to API610 Standard. GS/GF, through many years of performance and experience, has excellent reliability and durability. 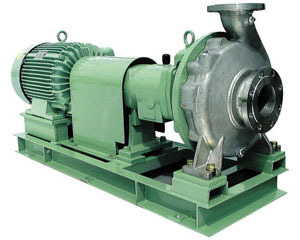 For cast-iron material the pump model is GF. -5ºC∼120ºC in case of Cast & Ductile Iron. Self and external flushing type . Inside and outside types . Quenching is adopted for pumping liquid of temperature less than 0ºC.